I would like to especially thank Bernhard Blaza, a descendant of Meinolph Gerbing (*1764, +1843) for his help in compiling this factory history and providing a translation of the Czech essay 'Skryte Poklady Ustecke Terakoty' by Vaclav Cilek and Jan Nemec which was originally released in 2004. As you can see when reading this page, the provided info not only helped to clean up a few disputed points but also created at least one attribution problem. The locations mentioned require some clarification as the former Austrian towns of 'Bodenbach' (today Podmokly, district Dĕčín IV) since 1942 and 'Obergrund' (today Horní Žleb, district Dĕčín XI) since 1950 are parts of the city of Tetschen (today Dĕčín), which also includes the former town of 'Biela bei Bodenbach' (today Bĕlá, district Dĕčín X). In the year 1812 Johann Eugen(ius) Philipp Leyhn founded a small business in the town of Wermsdorf (Saxony) and started to produce pipe bowls. As the work itself did not require experienced workers, Leyhn employed young apprentices that were of course much cheaper than normal workers and the small business soon started to flourish. Soon a few larger customers like the metalware company Rössler in Nixdorf (Bohemia) became interested in his products as they were looking for a source of pipe bowls as they produced the fitting lids and mouthpieces. Because the supply with basic materials was not sufficient to support a larger business, Leyhn started to run a new factory in the town of Pirna (Saxony) in 1815 which did not become operational until 1817. Of course his apprentices followed him to Pirna and also continued to work for Leyhn long after their apprenticeship. It should be noted that the deal between Leyhn and Rössler was discontinued around 1923 after a drastic increase in custom fees on items that passed the border to Bohemia (Austria). Anyway, two of the apprentices working for Leyhn were Wilhelm Leberecht Schiller (*1797 in Kreppendorf bei Wermsdorf) and Friedrich Vincent Meinulph Gerbing (*1798 in Riesa) who together founded their own small business in Bodenbach in the year 1829; it at first merely consisted of a small house with a shed that was used as studio and the only kiln was located outside. At first only using the more local resources, the company later imported clay from the town of Belgern near Meißen and Bresta near Teplitz; the coal they mainly used came from the area around Aussig. 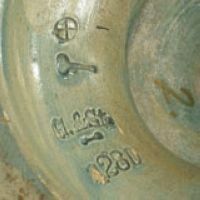 The two partners were approached by the Rössler company which was desperately looking for a reliable source for pipe bowls again after trying various other manufacturers in Bohemia and so they started producing pipe bowls made from a material named Siderolith which closely resembles fine earthenware and is mostly found with an unglazed but finely grained and often varnished surface. Main feature of the material was of course its durability and that it did not need to be painted or decorated as it was completely colored (dyed) before being formed into objects. Even though the business relationship with Rössler helped the young company through the first dire months, Schiller & Gerbing wanted to focus on producing terracotta and decorative majolica with darker glaze and color combinations. In fact they later exactly for this reasons delegated the work on the pipe bowls to one of their employees who knew the job quite well: Eduard Leyhn, the son of their former employer had started working for Schiller & Gerbing. One of the first chances the small business took was to present itself at the industrial fair in Prague in the year 1831. Nobody would have thought it possible but after just two years of existence the company received its first medal, a bronze award. This impressive success resulted in various contracts with companies in in England, the Netherlands and North America and six years later the same fair saw the partners present themselves again, this time leaving with a silver medal. What makes one wonder is that the premises of the company were very small even if both partners owned a few houses in Tetschen and Bodenbach. For some reason never really tried to find a much larger location for their factory, instead they rather spread to different locations. A very interesting fact is that in 1841 they opened a small studio in Tetschen which - at first - did not produce anything. Reason was that it was located in direct vicinity of a factory owned by a former employee, who had left Schiller & Gerbing a short time before - it was Adolf Bähr who then went on and founded the company of Bähr & Maresch (later Johann Maresch) in the town of Aussig upon the river Elbe. 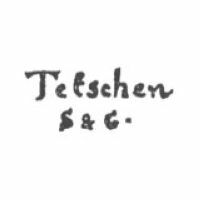 Only a few years later, the Schiller & Gerbing Tetschen branch was sold to the Gebrüder Heinzen ('Heinzen brothers') which owned various dyeworks. Next to the cramped location and various other issues the main problem during the first half of the 1840s was that a large part of the raw materials that had been promised to Schiller & Gerbing actually never arrived as they were used by the local officials to support the building of the Prag to Dresden railway. After some discussion the company received generous reparation payments and finally invested these to build a new factory in Nieder-Ulgersdorf (today Dolní Oldřichov, Dĕčín VIII) from 1845 onwards; the new factory was also able to produce the required colors and glazes itself instead on having to rely on various smaller companies as suppliers. 1845 also saw the company finally presenting itself on the industrial fair in Vienna and even though the competition was by far more impressive than at the fair in Prague, the fair ended with an overwhelming success for Schiller & Gerbing after they received the silver medal for design. When one takes all the problems into mind it is even more astonishing that over the years the company managed to produce a large range of ornamental vases, centerpieces, clock casings, ewers, jardinières and pedestals, wall plaques and wall pockets as well as more practical items like candlesticks, card trays, humidors, lamps, matchboxes, pitchers and steins. Finally owning a larger factory could have been the final breakthrough but in 1848 Friedrich Vincent Meinulph Gerbing died and left his shares in the hands of his wife. Karoline Gerbing was a resolute woman and the determination and background knowledge she revealed when tackling problems not only proved Schiller that she was an excellent businesswoman. There are some indications that this lead to constant tension between the two totally different people and soon Schiller decided it would be better to leave and around two years after the death of his former partner he founded a new business in the town of ⇒Obergrund near Tetschen. To understand the further proceedings one must know the family situation at that time. Karoline and her late husband had two children, a married son named Friedrich Ludwig Gerbing (born 1828) and a daughter named Antonie Emelie Gerbing who was married to a Mr. Hausschild. At first Mrs. Gerbing continued business on her own and on December 11th 1851 finally received her own factory license but her son-in-law Hausschild proved to be a squanderer and often relied on the Gerbing family to help him out of tight fits. This may have been the reason that Karoline Gerbing had to sell the mill and surrounding facilities that were used to produce the raw materials in Nieder-Ulgersdorf in 1854 but Hausschild might also just have been an additional factor that further influenced the dire financial situation as the overall state of the whole remaining factory was slowly getting worse. Things started to change a little in 1855 when Friedrich Ludwig Gerbing and his wife proudly announced the arrival of their first son which then was named Friedrich Alexander Gerbing. The situation of the whole family improved even more after Antonie finally got a divorce. The basic problems however still remained and two years later the local fire prevention office stated that the kilns were in a very bad state because they had not been repaired and serviced for a long time. In early 1859 the family then received a visit from a Prussian businessman with the name of Julius Reinhold Hermann Stephan who was actually looking for a good business opportunity - at first. But during the first months of cooperation it became obvious that both Julius and Antonie had more than a simple business relationship in mind. Funded by Stephan the first phase of vital repairs was initiated in 1860 and even if the work went fluently, all was thought lost when the wooden building containing the raw material storage caught fire and completely burned down. But as so often, an end can also be a new beginning: Julius proposed to Antonie and to the joy of Karoline, Friedrich Ludwig Gerbing announced that his wife was pregnant again. It really was time for something new and so Julius Reinhold Hermann Stephan and his brother-in-law Friedrich Ludwig Gerbing refounded the company under the name of Gerbing & Stephan, an event that was soon followed by the birth of Friedrich's second son Emil Alexander Gerbing in 1861. After a fresh start the company soon managed to drastically improve its situation. While businessman Stephan took care of the financial side and used his contacts to find customers, Gerbing was responsible for the design and production. This combination was very successful indeed and in 1880 they were present at the Christmas exhibition of the Austrian museum for industry and art in Vienna which turned out to be the greatest success in the history of the Gerbing family as they were honoured with the national award in silver. In the early 1890s, the company was then taken over by Friedrich Alexander and Emil Alexander Gerbing who together run the factory without larger changes; they kept the company name of Gerbing & Stephan but from around 1900 onwards marked with 'F&A G'. The business was by now totally specialized on the production of historicism styled majolica and this proved fatal as the restrictions on imports to the US market were followed by a change of taste in direction of the upcoming art nouveau style. Unable to change the product range in a way that would have perhaps enabled continuing success, the brothers had to file for bankruptcy and close the factory in 1903, two years before their father Friedrich Ludwig Gerbing died at the age of 77. While Friedrich Alexander Gerbing moved on to successfully start a totally new carreer (he died at the age of 72 in 1927), his brother Emil Alexander Gerbing tried to establish a factory for electrotechnical porcelain and insulators in the town of Biela bei Bodenbach (today Belá, Dĕčín X) which sadly enough was not successful at all and Emil Alexander was forced to work for a smaller insulator company before he finally retired and at the age off 77 died on on August 2nd 1938. After the closure of the factory in 1903 the buildings in Bodenbach had been sold to the company of Wolfrum & Co. from Aussig who let them off to various companies, with the last being the Bergmannwerke Elektrizitäts-Ges.m.b.H. electricity company in 1919 that then bought the buildings in 1922. In 1938, the premises were resold to the Nordböhmische Elektrizitätswerke (N.E.W.) who the same year had the buildings at the top of Teplitz road demolished to make room for a small park that still exists today. The remaining buildings on lower Teplitz road now belong to the C.E.Z. (successor of the N.E.W.) and on first sight, nothing reminds the visitor that these buildings once housed one of the largest companies in Bodenbach. But sometimes living memory sometimes is better than any brass plate and if you ask anybody passing by what the buildings over there are called, the reply will include the Czech pronounciation of a well-known name: Gerbink. When trying to identify one of the items mentioned in the above history, one should hold a few things in mind. Of course a close examination and comparison of items is required when looking for the manufacturer but most of all one should think about the truth behind some books or websites. The following passages will reveal some of the glitches and misrepresentations. 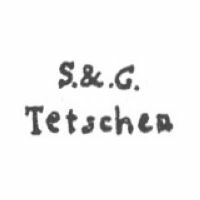 First point of interest is another manufacturer that used an 'S&G' mark: In 1885 a company named '⇒Schmelzer & Gericke from Althaldersleben in Saxony also introduced a simple 'S&G' mark; they soon were forced to use a dfferent one (registered in 1886) but some items found to bear the 'S&G' mark were definitely not made by Schiller & Gerbing. It should be noted that perhaps the founding or registration in 1885 was responsible for some comments incorrectly claiming that the Schiller & Gerbing company had split that year. The next point is that all the different companies of Schiller & Gerbing, Gerbing & Stephan and W. Schiller & Sohn are claimed to be somehow connected with a British company located in Isleworth that is mostly claimed to have done decoration work. It just can not be true: the Isleworth Pottery was located at Railshead Creek near Hounslow (Middlesex, England) and was founded around 1757 (as pottery, not a decoration studio!) by Joseph Shore and his two daughters; the company marked with 'S. & Co.'. 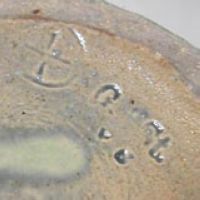 Ann Shore was married with the superintendent Benjamin Quarman who was responsible for the porcelain production which was discontinued after his death in 1787. Mary Shore married Richard W. Goulding, who had worked in Worcester and after the marriage also became partner; hence the company was renamed to Shore & Goulding - which of course explains the 'S&G ISLEWORTH' marked pieces that neither by design or decoration fit into the portfolio of Schiller & Gerbing as Isleworth specialized on making Staffordshire-type pottery, relief-decorated tea pots, etc. in blue and white, chalky in base colour and of low translucency, indebted to Bow and Derby. The Isleworth pottery from 1825 onwards is claimed to have moved to Hounslow; it seems the company then moved to Wales in 1827 and apparently closed in 1831 or shortly afterwards. All information available clearly shows that the Isleworth Pottery had vanished even before the initial company of Schiller & Gerbing started any export activity and that also sinks the often claimed relationship between Isleworth and Schiller & Sohn. I therefore believe that many years ago some person simply confused the different 'S&G' marks and puzzled together some story that has been copied without verification until today. Finally, there's at least one mark around that appears to cause a little confusion: it shows a single 'G' above a chain bridge. 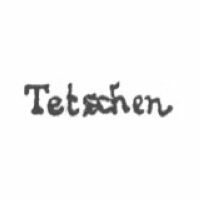 While some sources state that this mark belongs to the company of Julius Greiner & Sohn which was also located in Bodenbach, other sources (including the Czech authors Vaclav Cilek and Jan Nemec) claim that this mark belonged to Gerbing. I dare to challenge the latter statement, for two reasons. 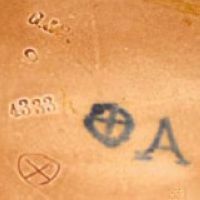 The first is of course that -so far I know- not one old mark reference shows the chain bridge mark attributed to Gerbing. 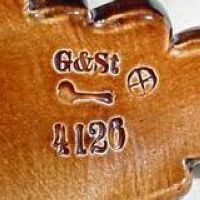 The second reason is based on common sense, as people claiming Gerbing as origin came up with the date range of 1880-1890 for the chain bridge mark. Reason number two is that the Gerbing company, in all of its various stages, always used letter combinations like 'S.&G.' or 'G.&St.'. I ask myself why the company during the highly successful period of Gerbing & Stephan should have suddenly reverted to marking with a simple 'G' - it does not make sense, not only because the 'G.&St.' 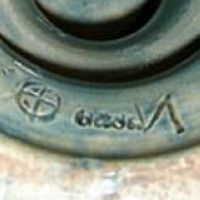 registered trademark (used from 1861 onwards) was well-known and had its own, pretty good reputation. Even *if* I would for a moment assume that the Gerbing company *had* used a single 'G' as marking - would that not have been between 1850 and 1861, the period in which the company was merely named Majolikafabrik F. Gerbing ? 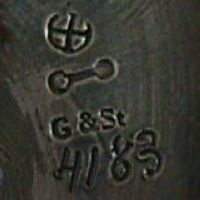 I have so far not received any proof or further information on this matter, hence I simply can not believe such a claim - the chain bridge mark therefore remains attributed to Julius Greiner & Sohn until somebody can offer rock-hard proof that it indeed belonged to Gerbing. 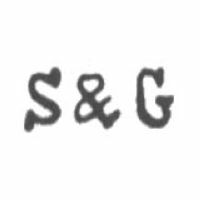 Used between 1829 and 1850, 'S&G', standing for Schiller & Gerbing. 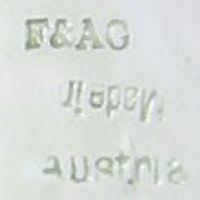 Used between 1850 and 1861, 'F.G' standing for Friedrich Gerbing. Used between 1861 and 1900. Used between 1861 and 1900, here with very clear 'G&St.' marking. 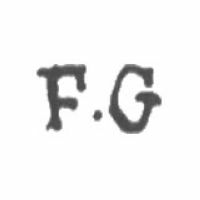 Used from around 1900 until 1903, the 'F&A G' standing for Friedrich & Alexander Gerbing.